ould your spouse live on just one Social Security benefit? Your clients risk losing their paycheck if they don't plan for the death of their spouse! Here, life insurance makes its grand entrance. Many couples forget to plan for the loss of a Social Security check when one of them dies. Do your part for Life Insurance Awareness Month and educate couples. Show them how life insurance can protect their Social Security benefits by covering final expenses and replacing lost income. So you’ve successfully planned for the many foreseeable expenses of retirement, and you’ve maximized both spouse’s Social Security benefits. In general, the breadwinner should delay claiming his or her benefit. 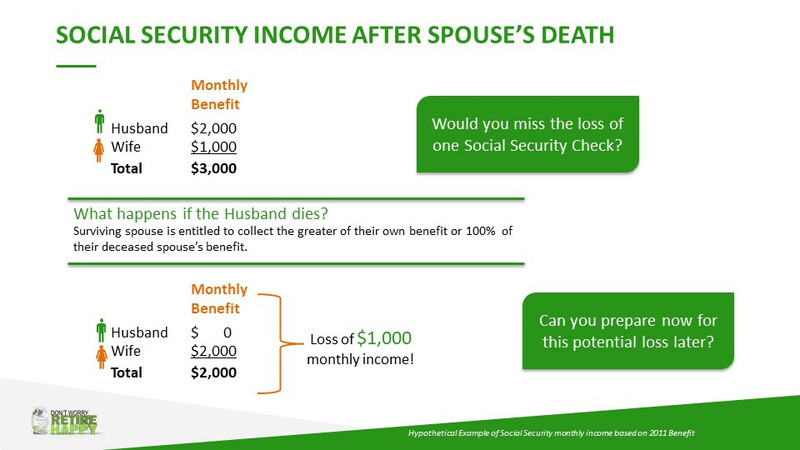 This locks in a higher monthly Social Security check not only for the breadwinner but for the surviving spouse as well. But what happens if one spouse dies? Well the surviving spouse would lose one of the benefits entirely! Life insurance can protect that Social Security benefit. A young family needs life insurance on a working spouse to help replace the lost income if the spouse dies unexpectedly. Life insurance can replace retirement income like Social Security, that will cease at the death of a spouse. The death benefit of nearly every policy can provide an immediate lump sum to cover final expenses, but policies like permanent life insurance can provide further retirement income through their cash value (generally, free of income tax). Plus, the younger a couple uses one of these policies, the longer it has to build the cash value benefit to provide retirement income. Couples need to find some other money to build an income bridge so the breadwinner can delay claiming their Social Security benefit. While one spouse delays and the other claims their benefit, consider using a small portion of that check to pay the premiums on life insurance because it can be purchased for pennies on the dollar. In maximizing Social Security benefits,couples need to protect that guaranteed lifetime income, and life insurance creates a warm homestead amidst the topic many find difficult to discuss. Don’t let your spouse be left out in the cold.